Make yourself at home in one of the 405 air-conditioned rooms featuring LCD televisions. Your pillowtop bed comes with down comforters and premium bedding. Complimentary wireless Internet access keeps you connected, and cable programming is available for your entertainment. Bathrooms have complimentary toiletries and hair dryers. With a stay at Candlewood Suites Norfolk Airport in Norfolk, you'll be within a 10-minute drive of Norfolk Premium Outlets and Norfolk State University. This hotel is 7 mi (11.2 km) from Virginia Beach Town Center and 9.5 mi (15.3 km) from Naval Station Norfolk. Featured amenities include a 24-hour business center, express check-out, and dry cleaning/laundry services. Planning an event in Norfolk? This hotel has facilities measuring 15000 square feet (1394 square meters), including a conference center. Guests may use a cruise ship terminal shuttle for a surcharge, and self parking (subject to charges) is available onsite. With a stay at SpringHill Suites Marriott Norfolk Old Dominion University in Norfolk, you'll be a 5-minute drive from Old Dominion University and 8 minutes from Sentara Norfolk General Hospital. 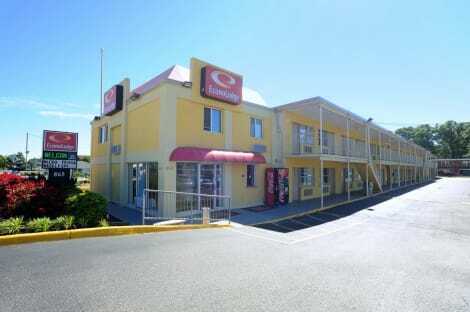 This hotel is 4.4 mi (7 km) from Naval Station Norfolk and 3.8 mi (6.2 km) from Norfolk Scope. Featured amenities include complimentary wired Internet access, a 24-hour business center, and express check-in. Planning an event in Norfolk? This hotel has 10000 square feet (929 square meters) of space consisting of a conference center and a meeting room. A roundtrip airport shuttle is complimentary (available on request). Discover the best that the city of Norfolk, VA has to offer from the stylish Hilton Norfolk The Main. 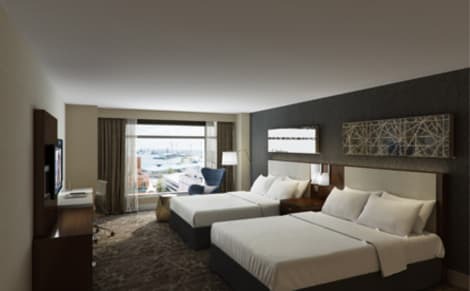 Set in the heart of downtown, with beautiful views of Elizabeth River, the hotel offers easy access to a wealth of restaurants, shopping, outdoor recreation, night life and attractions.You don't have to leave our Norfolk, VA hotel to enjoy world-class dining. The hip, urban Saltine offers the region's finest seafood, and a huge selection of wines and craft beers. Our wine and piano bar, VARIA, serves upscale trattoria-inspired Italian fare from its open kitchen; and our relaxed rooftop bar and lounge, Grain, features terraced patios, with trees and lighting designed to invoke an inviting, backyard garden vibe.Take in views of downtown or the river from your guest room or suite. Feel at home with WiFi, a flat-screen TV and an ergonomic desk. Choose an Empyrean Club Level room to enjoy perks like continental breakfast, evening hors d'oeuvres and a bar. Maintaining your exercise routine is easy at this downtown Norfolk, VA hotel, with an indoor swimming pool and a state-of-the-art, 24-hour fitness center.Boasting 42,000 sq. ft. of meeting space and a 20,000 sq. ft. conference center, this hotel is the ideal venue for your wedding, conference or banquet. Choose from a variety of rooms and breakout spaces, including an 18,500 sq. ft. ballroom. Contemporary A/V technology, inspired catering and our dedicated staff will ensure your function is a success. lastminute.com has a fantastic range of hotels in Norfolk, with everything from cheap hotels to luxurious five star accommodation available. We like to live up to our last minute name so remember you can book any one of our excellent Norfolk hotels up until midnight and stay the same night.